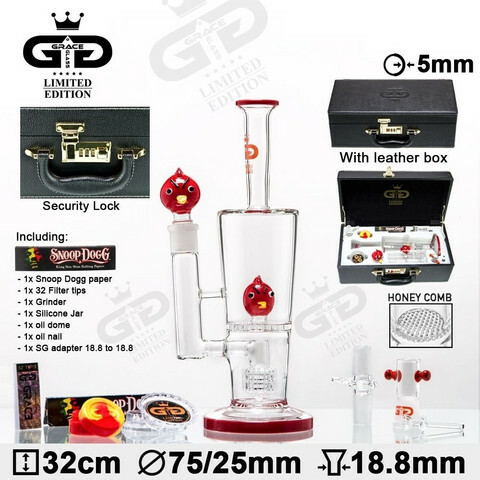 This G-Bird Bong is a Grace Glass Limited Edition that will offer you a momentous smoking experience! It is made of a high quality heat proof borosilicate glass, formed in the shape of a flat base bottle tube of 30cm height and 75/25mm diameter. You can place your favourite herbs upon the extraordinary detachable red G-Bird bowl, which connects to a built-in drum diffuser through a built-in chillum with a sure ground of 18.8mm diameter. What's more, a Red G-Bird honeycomb disk will furthermore break up your smoke. With the Grace Glass logo featuring at the top of the tube, the whole set-up ends up in a delicate mouthpiece ring for a more pleasant experience. Finally, the bong comes in a luxury leather box including a 1x grinder, a 1x silicon jar, a 1x32 filter tips, a 1x Snoop Dogg paper, a 1x oil dome, a 1x oil nail, a 1xSG adapter 18.8mm to 18.8mm. It therefore supports also oil use.